A judge in Labrador is going to court against the chief judge of the provincial court, with a claim that he has been wronged for commenting on the resources available in his region. 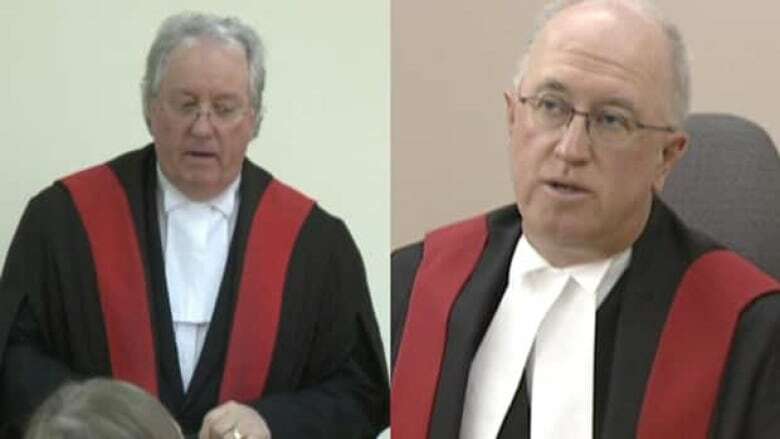 Judge William English feels that he was wronged by Mark Pike, the chief judge of Newfoundland and Labrador's provincial court, when Pike not only told him to be silent about comments about resources available to him, but warned him of possible disciplinary action. The dispute began in August 2011, when English released eight men from custody, noting that he had no choice. English said that the Criminal Code states the suspects could only be held for "three clear days" without a bail hearing unless the Crown or defence make arguments to the contrary. English claims that did not happen because of a lack of people and resources in Happy Valley-Goose Bay at the time. He said no other judge was available, and only one or two lawyers available to work for the prosecution or defence. English said he then received an email from Pike with the instruction, "Henceforth you are to refrain from any comment, from the bench or otherwise in public or private ... regarding the adequacy (or lack thereof) of judicial or court resources." On the same day, Pike also said in a CBC Radio interview that the suspects should have remained in custody. "I can say from a resource point of view, it shouldn't have happened," Pike said. In a further email, Pike wrote to English, "Your behaviour and actions regarding the release of the eight men (has been) referred to the Judicial Council" for potential disciplinary action. In an application to the Supreme Court of Newfoundland and Labrador, English wrote — among other things — that Pike "lacks jurisdiction" to keep him quiet and that Pike's commentary "denies [his] judicial independence" as well as his fundamental freedom of speech under the Charter of Rights and Freedoms. In the same statement of claim, English is also taking the Newfoundland and Labrador government to court. English says that Justice Minister Felix Collins has twice rejected his request to have his legal expenses paid. English also said he is entitled to have a retired Supreme Court justice decide if the provincial government should pay his legal costs. A hearing is set for late this month.